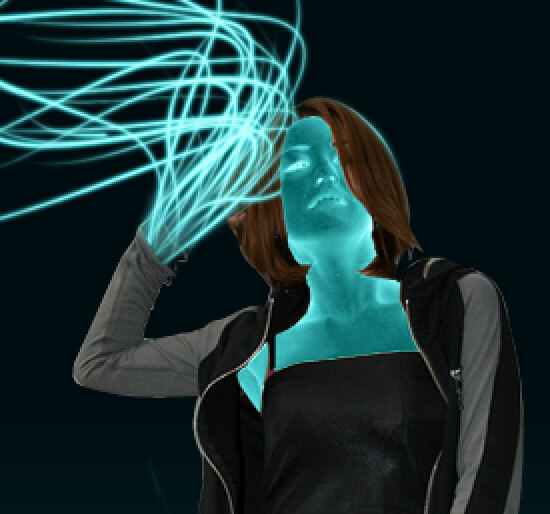 In our Photoshop Tutorial, we will create a Glowing Neon Girl from scratch. Throughout this tutorial, you will simply learn how to make some cool Glowing Effects in Photoshop. This is quite a little long so patience is a virtue.Take a look at the Preview of our Final Image. So to start, Open an new document in Photoshop.(800×1200). Working on our background,use #0e5358 and #020d11 color. Select Gradient Tool (G) and apply. Add New Layer. Select Rectangular Marquee Tool (M) and create a selection below the image. Use color #086f78. Then, Select Paint Bucket Tool (G) and apply a color.name the layer to BG1. Add another Layer. Name the layer to BG2 Shift+Click on BG1 layer so that selection will appear. Use color #000000 then select Gradient. Adjust the Gradient to foreground to Transparent. now apply the gradient on the upper part of the selection. Now that we’re done on our background, lets add the model. You can download to Model Stock Photo in HERE Now Start Removing the back using Pen Tool (P) or Polygonal Lasso Tool (L). After removing the background of the Model Stock Photo, transfer it to our working document using Move Tool (V) by dragging. Name the layer to Model Stock Photo. Lets try edit our Model Stock Photo first. Choose Lasso Tool (L) and select an area in the pants, Duplicate the selected are by Pressing CRTL+J then move it on the hand. The reason is we need to hide the hand using it. Once its on the right position you can use Clone Tool Tool (S) to clone the edges. Choose Lasso Tool (L) and select the area shown on the image below. After selecting, Press DELETE on your Keyboard. After all the editing and cutting our Image should now look something like this. Select Model Stock Photo layer then Click Add New Layer, This new layer is now between Model Stock Photo and Model Stock Photo 2 layer. Choose Pen Tool (P). adjust the Pen Tool to Path create something like on the image. Set color to #b0fcff. Right click to the path and choose Stroke Path>Brush. Make sure you check on Simulate Pressure.Name the layer to Glow. Now Right Click on the Glow layer and select Blending Mode then choose Outer Glow. from there, add color #2cecf1 ,Opacity to 100% and Size to 3 pixels.the effect will be like this. Continue adding more Glowing Effects and doing the same process until you made something like this one. Doing this 1 layer each in every path that you made is better so you have option to move and adjust. Now lets make the skin on the Model Stock Photo Glowing as well. Lets have a selection on the skin first. Select Magnetic Lasso Tool (L). Now start selecting the face. Then After the first selection Hold Shift then use the Magnetic Lasso Tool again so you can select another area while the first selection that you made is still selected. Do the same process until you finished selecting all the skin parts. Duplicate the Dup1 and name it to Dup2. Right click the Dup2 and go to Blend Mode. This time add and additional adjustment in Inner Glow. Use color #0af2ea and Opacity to 100%. Now CTRL+I to invert the color. For the hair, Add New Layer and lets do the same process like what we did on the glow effect on the Model Stock Photo hands. Check out the image below. Continue doing the same process on the hair.You can use 1,2 or 3 pixels thick on the brushes to have different sizes. Go back to the Model Stock Photo layer and erase the head part of the image. after erasing it will now look like this. This time we will make the glowing shadow thing. Use color foreground to #23d5d9. Add new layer below the Model Stock Photo layer. Choose Brush Tool (B) Use a blurry brush with a Master Diameter of 40 pixels and apply the brush.check the image below. Name the layer to Light Shadow 1. Now Duplicate the Light Shadow 1 layer. Go to Filter>Blur>Gaussian Blur and set the Radius to 10 pixels. 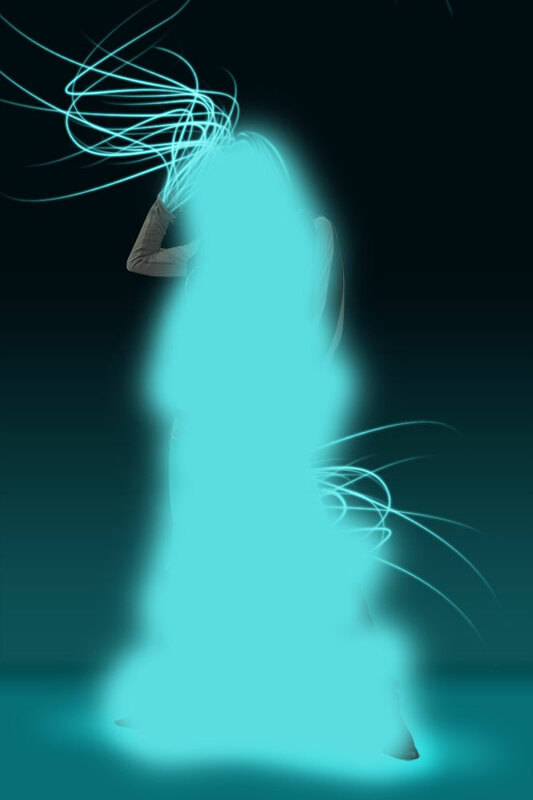 Now lets make the image a little dark so the glowing effect will be more emphasize. Add New Layer above glowing hair layers. Use color foreground to #31c1c7. Choose the brush and apply the brush on the whole body. Go to Filter>Blur>Gaussian Blur and set the Radius to 60 pixels.Name this layer to Add Glow. Now Our image is now something like this. On the layers palette change,set it to linear Burn and Opacity to 50%. Now our image will look like this. Time to add highlights on the jacket,short and the shoes. Add New layer above the Add Glow layer. Name it to Highlight. Choose Brush with a blurry brush and having a Master Diameter to 15 pixels. Apply the brush on the area which near to the skin Check the image below on where to add the highlights. On the layers palette, choose Color Dodge and Opacity to 60%. Now we have a little highlights. Now lets create a little Sparkling Effect on the hands Add new layer, and choose Brush Tool (B). Apply the brush on the Glowing Effect area. See the image below. Let do another one. Add new Layer, use Brush Tool. Use Master Diameter of 5 pixels on the brush. Apply something similar on the image below. Add new layer. Now lets create a vertical line. Choose Brush Tool with a Master Diameter of 2 pixels and start making lines. We’re almost done in here. for the last part, Add new layer and go to blending mode by right click on the layer and select Outer Glow. From there, Set the color to #2cecf1, Opacity to 100%, Noise to 38% and Size to 0%. Now choose Brush Tool with a Master diameter of 2 pixels and create a dot on the lower part on each and every vertical dissolving lines. That’s a really cool effect. Thanks for sharing with us! Wow pretty long but worth the read. I really like how you did it Naldz. Great work. Wow, Naldzgraphics u guys rock ! Great graphic, nice work done. Very interesting. The missing hands are a bit creepy but it makes for a nice effect and it’s great. thanks for teaching us designers how. Help please, at steps 10 and 11 I have a brut line in the tentacle, what’s the matter ? Make sure the layer of the tentacle your saying must be in between “Model Stock Photo” and “Model Stock Photo 2” layer. awsom tut it was very easy with the right steps. Excelente trabajo y fuente de inspiración. In what version of phososhop is this picture made? Keep up the good work and I will definately bookmark this website! What a great photo retouching tutorial which I will recommend to my students. Thanks for sharing! Thanks for shearing Ronald ! interesting effect and great tut, thanks for sharing. Thanks for sharing! Some really good tips here – bookmarked. Hi Ron, when making the tentacle, what size brush and hardness do you specify for the stroke? I always click on simulate pressure, but can not get past the blunt end of the stroke. Thank you soooo much for your help. Hadn’t seen this before. Well done. WoW 🙂 Awesome Tutorial. Easy and well explained . Fantastic to learn. Thanks to share this nice tutorial. cool effects and some really good tips thanks! Great tutorial. Step by step learning system is so helpful. To thos who can’t get the STEP 11, first adjust the brush size to, i think in the range of 11. then go back to Pen tool and click stroke fill and brush and click Simulate Pressure. That works for now. be sure to select the glow layer and it is between the two images. Its realy amazing effect, thanks for helping me……. This is amazing…..what a fantastic effect you have created…Thanks a lot dude. No explanation as to what to do if the individual steps don’t work….and no idea what layer you’re talking about here. For the blunted edge issue you can also try selecting the brush tool, right clicking at the brush icon in the top left corner (this is in CS5 I’m not sure if it has the same location in other versions) and resetting the brush tool before changing the size and hardness.